Zimbabwe's widely respected fire brigade usually tackles house fires and traffic accidents, but it became a symbol of the regime during anti-government demonstrations that turned into violent looting and arson in January. "It was vicious," said Richard Peterson, the Bulawayo fire brigade chief. "We were just trying to save lives. "We had never been stoned before, and we felt overwhelmed. We had to get police escorts and that made our response times too slow - often an hour or two instead of 10 minutes. "One shift stayed on duty for three straight days. It was unprecedented." Peterson says he understands how Zimbabwe's economic crisis has bred deep frustration and anger, which boiled over after a sudden government announcement to more than double fuel prices. "But we need to focus on engaging with the problems, not destroying each other's property," he said, two weeks after the protests in which supermarkets, shops and garages were targeted by looters nationwide. The protesters' rage focused on the Zanu-PF party that has ruled Zimbabwe since 1980, first under Robert Mugabe until 2017, and now under his former deputy President Emmerson Mnangagwa. Bulawayo, a former industrial hub in the country's southwest, is a stronghold of opposition to Zanu-PF and the city was at the centre of the protests that erupted on January 14. After years of national economic decline and crumbling state services, Bulawayo's fire brigade should have 320 employees, but is 70 people short because of budget cuts. Its staff say their wages have been drastically weakened by the country's little-trusted "RTGS dollar" currency, and that they fear their pension savings have disappeared into thin air. "We need better rescue equipment more than anything," said firefighter Thabani Masuku, 33, as echoing loudspeakers conveyed orders around the 1950s-built station in the Famona district close to the city centre. Masuku said he loved his job but, like many other Zimbabweans, he is thinking of leaving the country as the nation's hardships worsen under Mnangagwa, who had promised to revive the ruined economy. "I'm so lucky to have work, as many other people don't," Masuku said after attending daily morning parade and then conducting a routine check of a truck's equipment. "To be honest, all my friends of my age who I grew up with have gone to work in South Africa or Botswana. "Everyone is outside the country. Sometimes I'm on the edge myself, as I'm not sure whether to stay or go." When on duty, the firefighters rest and cook meals in a basic kitchen on the upper floor of the station - always ready at a moment's notice to slide down a polished steel pole to their vehicles waiting below. In stark evidence of Zimbabwe's woes, long queues of people wait outside every bank in central Bulawayo to try to withdraw cash, which is often limited to a little as $20 in RTGS dollars a time. After decades of government mismanagement, Zimbabwe's fire service survives thanks to donated vehicles and equipment, mainly from former colonial power Britain. Fire trucks also get priority diesel supplies from the government, as do ambulances, which use the fire station's pump to fill up. 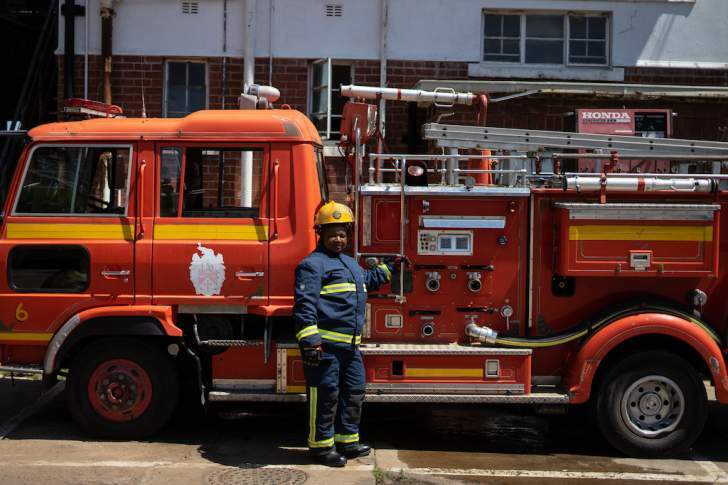 "Without fuel, we would not be any use, so thank God that we have not yet run out," said Busisiwe Gumbo, 46, the female head of the firefighting team, a member of the brigade for 21 years. "I'm proud of our work, but the challenges now make it very difficult."